An authentic, natural feminine wellness brand backed by years of science & trusted by women everywhere. 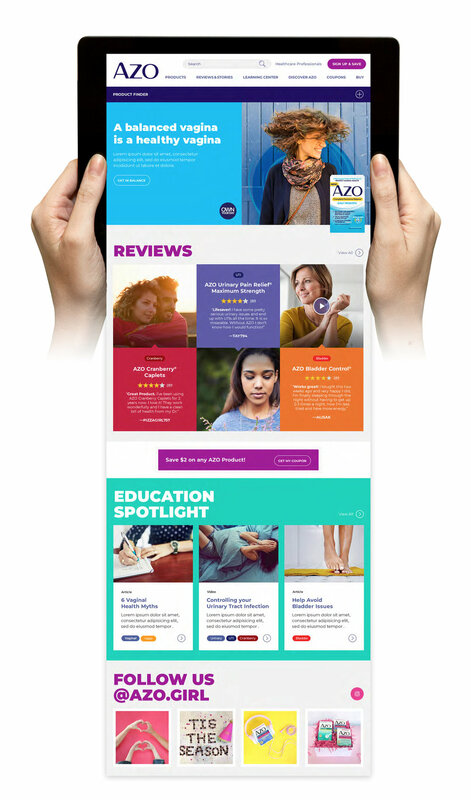 AZO is committed to providing high quality urinary, bladder, and vaginal health products. They have strong direct competition in the UTI and yeast categories, and little to no direct competition in bladder. While brand recognition for some competitors is high, their sites and other digital channels fall short of expectations. On the other side of the spectrum, many sites in the feminine hygiene, personal care, and beauty categories are at the forefront of digital design, functionality, and user experience. These hyper-competitive industry categories are pushing the boundaries. Where does AZO fit into the landscape? Analytics indicate that the majority of users are seeking out the specific product they need by clicking on the box. By building on a personalization platform that can integrate seamlessly with advertising, social, and search targeting, AZO can move products and content forward based on segmentation rules. We wanted to create a UX concept that mirrored the in-store experience. Our research showed that consumers would typically shop online for information based on their symptoms, but go to their local pharmacy to purchase the item. The actual package design was crucial to how consumers identified the products—both on and off-line. It was important to give the user the ability to view the box at a realistic scale as well as being able to see the back of the box for Facts. We leveraged the Google Image Search functionality as a prototype to demonstrate one of the UX concepts. In order to educate consumers on how AZO's internal teams view their product categories, we inadvertently created two methods of categorizing their products. The first was to utilize the product color consistently and exclusively wherever the product would appear online. The second method was to tag every piece of content with an appropriate category tag(s) and color that also extended into the site-wide navigation structure.